As the holiday season approaches and the calendar begins to populate, it’s important not to allow the stress of entertaining large groups to become a burden. Below are four tips to help organize a kitchen and host with ease, creating a functional space for family and friends to enjoy. Set aside time early in the week to plan the menu, from simple appetizers to the main entree. Grocery shopping apps, like AnyList, allow the whole family to share and build lists together — which can help avoid any last-minute trips to the grocery store. Also, try to identify dishes that can be prepared in advance so more time can be spent away from the kitchen when guests arrive. Optimize counter space by designing small stations for easy access to the necessities. A coffee bar “nook” complete with Keurig cups and mugs can help kick-start a busy day. Storage near the fridge should be stocked with foil and containers, ideal for packing up leftovers after a large party. Reserve the island counter for meal prep and the cabinets below for serving ware and glassware storage. Cleaning is often the most time-intensive chore in the kitchen, but if designed right, can be a breeze for home entertainers and kids alike. 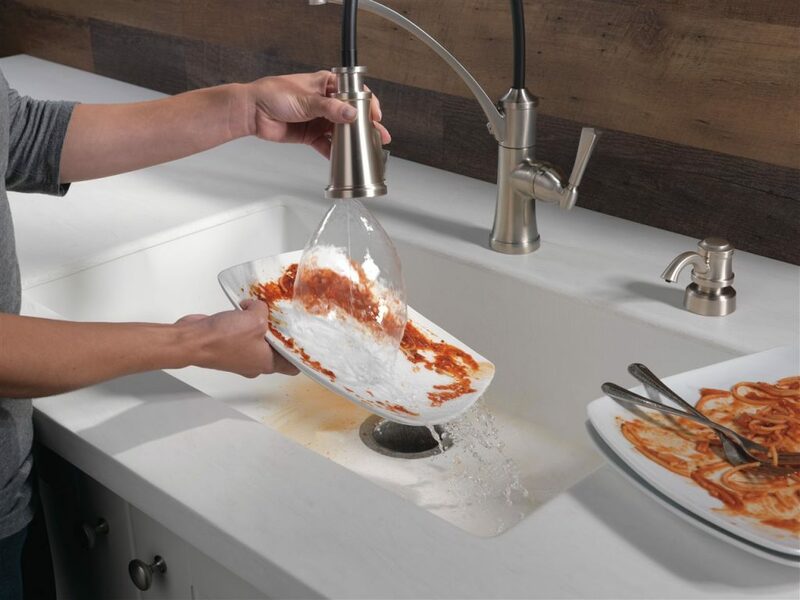 The Delta Foundry Kitchen Faucet complete with ShieldSpray Technology, available at the Home Depot, offers laser-like precision to contain splatter, meaning less soaking, scrubbing and shirt swapping.